All Apple systems include debugging facilities added by Apple engineering teams to help develop and debug specific subsystems. Many of these facilities remain in released system software and you can use them to debug your code. This technote describes some of the more broadly useful ones. In cases where a debugging facility is documented in another place, there's a short overview of the facility and a link to the existing documentation. Important: This is not an exhaustive list: not all debugging facilities are, or will be, documented. Many of the details covered in this technote vary from platform to platform and release to release. As such, you may encounter minor variations between platforms, and on older or newer systems. Known significant variations are called out in the text. This technote was written with reference to iOS 4.1. Warning: The debugging facilities described in this technote are unsupported. Apple reserves the right to change or eliminate each facility as dictated by the evolution of the OS; this has happened in the past, and is very likely to happen again in the future. These facilities are for debugging only: you must not ship a product that relies on the existence or functionality of the facilities described in this technote. In addition to this technical issue of binary compatibility, keep in mind that iOS applications must comply with various legal agreements and the App Store Review Guidelines. Note: If you also develop for Mac OS X, you may want to read Technical Note TN2124, 'Mac OS X Debugging Magic'. GDB is the system's primary debugging tool. For a full description of GDB, see Debugging with GDB. Xcode is Apple's integrated development environment (IDE). It includes a sophisticated graphical debugger, implemented as a wrapper around GDB. For more information about Xcode, see the "Tools & Languages" section of the Apple developer Reference Library. This technote does not cover performance debugging. If you're trying to debug a performance problem, the best place to start is the Getting Started with Performance document. The later sections of this technote describe the debugging facilities in detail. Many of these facilities use similar techniques to enable and disable the facility, and to see its output. This section describes these common techniques. Some debugging facilities are enabled by default. However, most facilities must be enabled using one of the techniques described in the following sections. In many cases you can enable a debugging facility by setting a particular environment variable. You can do this using the executable inspector in Xcode. Figure 1 shows an example of this. Some debugging facilities are enabled by setting a special preference. You can set such a debugging preference by configuring a command line argument in Xcode. Figure 2 shows how this is done. Many system frameworks include routines that print debugging information to stderr. These routines may be specifically designed to be callable from within GDB, or they may just be existing API routines that are useful while debugging. Listing 1 shows an example of how to call a debugging routine from GDB; specifically, it calls CFBundleGetAllBundles to get a list of all the bundles loaded in the application, and then prints that list by calling the CFShow routine. Note: When calling a routine like this, GDB must know the routine's return type (because some return types can affect the way in which parameters are passed). If you're calling a routine without debug symbols, you have to tell GDB the return type by adding a cast. For example, Listing 1 casts the return type of CFBundleGetAllBundles to (void *) and the return type of CFShow to (void). Similarly, if you call a routine with non-standard parameters, you may need to cast your arguments to ensure that GDB passes them correctly. If you don't see the output from the routine, you may need to look at the console log, as described in the Seeing Debug Output section. Important: If you use this technique for your own code, be warned that it doesn't always work for routines that are declared static. The compiler's interprocedural optimizations may cause a static routine to deviate from the standard function call ABI. In that case, it can't be reliably called by GDB. In practice, this only affects Intel 32-bit code, as used by the iPhone Simulator. You can learn more about configuration profiles by reading the various documents accessible from iPhone in Business site. NSLog is a high-level API for logging which is used extensively by Objective-C code. The exact behaviour of NSLog is surprisingly complex, and has changed significantly over time, making it beyond the scope of this document. However, it's sufficient to know that NSLog prints to stderr, or logs to the system log, or both. So, if you understand those two mechanisms, you can see anything logged via NSLog. Printing to stderr is one of the most commonly used output mechanisms. Given this topic's importance, it is covered in depth in the next section. The easiest way to view the system log is in the Console tab in Xcode's Organizer window. If you're working with users who don't want to install Xcode, they can view the system log using the iPhone Configuration Utility. If you launch a GUI application as it would be launched by a normal user, the system redirects any messages printed on stderr to the system log. You can view these messages using the techniques described earlier. If you run a program from within Xcode, you can see its stderr output in Xcode's debugger Console window (choose the Console menu item from the Run menu to see this window). Attaching to a running program (using Xcode's Attach to Process menu, or the attach command in GDB) does not automatically connect the program's stderr to your GDB window. You can do this from within GDB using the trick described in the "Seeing stdout and stderr After Attaching" section of Technical Note TN2030, 'GDB for MacsBug Veterans'. While it's very unusual to write a significant amount of code in assembly language these days, it's still useful to have a basic understanding of that dark art. This is particularly true when you're debugging, especially when you're debugging crashes that occur in libraries or frameworks for which you don't have the source code. This section covers some of the most basic techniques necessary to debug programs at the assembly level. Specifically, it describes how to set breakpoints, access parameters, and access the return address on all supported architectures. And these are exactly the items covered by the following architecture-specific sections. Important: The following architecture-specific sections contain rules of thumb. If the routine has any non-standard parameters, or a non-standard function result, these rules of thumb do not apply, and you should consult the documentation for the details. In this context, standard parameters are integers (that fit in a single register), enumerations, and pointers (including pointers to arrays and pointers to functions). Non-standard parameters are floating point numbers, vectors, structures, integers bigger than a register, and any parameter after the last fixed parameter of a routine that takes a variable number of arguments. For a detailed description of the calling conventions for all iOS devices, see iOS ABI Function Call Guide. The Intel 32-bit architecture used by the iPhone Simulator is described in the Mac OS X ABI Function Call Guide. Before you read the following sections, it's critical that you understand one GDB subtlety. Because GDB is, at heart, a source-level debugger, when you set a breakpoint on a routine, GDB does not set the breakpoint on the first instruction of the routine; rather, it sets the breakpoint at the first instruction after the routine's prologue. From a source-level debugging point of view this make perfect sense. In a source-level debugger you never want to step through the routine's prologue. However, when doing assembly-level debugging, it's easier to access parameters before the prologue runs. That's because the location of the parameters at the first instruction of a routine is determined by the function call ABI, but the prologue is allowed to shuffle things around at its discretion. Moreover, each prologue can do this in a slightly different way. So the only way to access parameters after the prologue has executed is to disassemble the prologue and work out where everything went. This is typically, but not always, quite easy, but it's still extra work. The best way to tell GDB to set a breakpoint at the first instruction of a routine is to prefix the routine name with a "*". Listing 2 shows an example of this. -- The breakpoint is not at the first instruction. -- Disassembling the routine shows that GDB has skipped the prologue. -- So we use a "*" prefix to disable GDB's 'smarts'. Important: Because iOS has no way to run programs from the command line, iOS-specific listings, like Listing 2, are taken from Xcode's Console window. And because the Console window does not support the '#' character for comments, comments are denoted by a leading '--'. If you try to replicate these examples yourself, you must not enter these lines into the Console window. In contrast, some other listings in this document were created on Mac OS X, and thus use traditional GDB comments. Finally, if you're looking for information about specific instructions, be aware that the Help menu in Shark (included in the Xcode developer tools) has an instruction set reference for ARM, Intel and PowerPC architectures. In ARM programs the first four parameters are passed in registers. The return address is in register LR. Table 1 shows how to access these values from GDB when you've stopped at the first instruction of the function. On return from a function the result is in register R0 ($r0). Because parameters are passed in registers, there's no straightforward way to access parameters after the prologue. Listing 3 shows an example of how to use this information to access parameters in GDB. -- We've stopped after the prologue. -- Hey, the prologue hasn't modified R0..R3, so we're OK.
-- first parameter is "alloc"
-- second parameter is "formatOptions"
-- third parameter is "format"
-- It turns out the prologue has left LR intact as well. -- So we can get our return address. -- the stack, always mask off bit zero. -- Now clear the breakpoint and set a new one before the prologue. -- to be in the right registers. -- Delete the other breakpoint to avoid thread-based confusion. -- Continue to the return address. The Intel 32-bit architecture is used in the iPhone Simulator. In 32-bit Intel programs, parameters are passed on the stack. At the first instruction of a routine the top word of the stack contains the return address, the next word contains the first (leftmost) parameter, the next word contains the second parameter, and so on. Table 2 shows how to access these values from GDB. After the routine's prologue you can access parameters relative to the frame pointer (register EBP). Table 3 shows the syntax. On return from a function the result is in register EAX ($eax). Listing 4 shows an example of how to use this information to access parameters in GDB. $ # 32-bit Intel binary. (gdb) # We've stopped after the prologue. (gdb) # the prologue because the parameters are on the stack. (gdb) # We can access them relative to EBP. (gdb) # first parameter is "alloc"
(gdb) # second parameter is "formatOptions"
(gdb) # third parameter is "format"
(gdb) # Now clear the breakpoint and set a new one before the prologue. (gdb) # the parameters relative to ESP. (gdb) # Set a breakpoint on the return address. The following sections describe a couple of gotchas you might encounter when debugging at the assembly level. If the routine is a C++ member function, there is an implicit first parameter for this. If the routine is an Objective-C method, there are two implicit first parameters (see Objective-C for details on this). If the compiler can find all the callers of a function (this most commonly happens when the function is declared as static), it can choose to pass parameters to that function in a non-standard way. This is very rare on architectures that have an efficient register-based ABI, but it's reasonably common for Intel 32-bit programs. So, if you set a breakpoint on a static function in an Intel 32-bit program, watch out for this very confusing behavior. When examining memory in GDB, things go smoother if you use the correct unit size. Table 4 is a summary of the unit sizes supported by GDB. This is particularly important when debugging on little-endian systems (all iOS devices and the simulator) because you get confusing results if you specify the wrong unit size. Listing 5 shows an example of this (taken from the Mac, but the results would be the same on an iOS device). The second and third parameters of CFStringCreateWithCharacters specify an array of Unicode characters. Each element is a UniChar, which is a 16-bit number in native-endian format. As we're running on a little-endian system, you have to dump this array using the correct unit size, otherwise everything looks messed up. (gdb) # in the buffer pointed to by the first parameter. (gdb) # Dump the buffer as shorts. Everything makes sense. (gdb) # This is the string "Auto-Save Recovery". (gdb) # Now dump the buffer as words. Most confusing. (gdb) # It looks like "uAotS-va eeRocevyr"! In some cases it's useful to crash your program in a controlled manner. One common way to do this is to call abort. Another option is to use the __builtin_trap intrinsic function, which generates a machine-specific trap instruction. Listing 6 shows how this is done. Note: The __builtin_trap intrinsic function generates a trap instruction on PowerPC and ARM, and a ud2a instruction on Intel. If you run the program in the debugger, you will stop at the line immediately before the __builtin_trap call. Otherwise the program will crash and generate a crash report. Warning: We recommend that you restrict this technique to debug builds; your release builds should use abort. Be mindful that the iOS application lifecycle is under user control, meaning that iOS applications should not just quit. Your release build should only call abort in circumstances where it would have crashed anyway, and the abort call prevents damage to user data or allows you to more easily diagnose the problem. Instruments is an application for dynamically tracing and profiling code. It runs on Mac OS X and allows you to target programs running on Mac OS X, iOS devices, and the iPhone Simulator. While Instruments is primarily focused on performance debugging, you can also use it for debugging errors. For example, the ObjectAlloc instrument can help you track down both over- and under-release bugs. One particularly nice feature of Instruments is that it gives you easy access to zombies. See the Instruments User Guide for details on this and other Instruments features. CrashReporter is an invaluable debugging facility that logs information about all programs that crash. It is enabled all the time; all you have to do is look at its output. CrashReporter is described in detail in Technical Note TN2151, 'Understanding and Analyzing iPhone OS Application Crash Reports'. The BSD subsystem implements process, memory, file, and network infrastructure, and thus is critical to all programs on the system. BSD implements a number of neat debugging facilities that you can take advantage of. The default memory allocator includes a number of debugging facilities that you can enable via environment variables. These are fully documented in the manual page. Table 5 lists some of the more useful ones. The default memory allocator also logs messages if it detects certain common programming problems. For example, if you free a block of memory twice, or free memory that you never allocated, free may print the message shown in Listing 7. The number inside parentheses is the process ID. You can debug this sort of problem by running your program within GDB and putting a breakpoint on malloc_error_break. Once you hit the breakpoint, you can use GDB's backtrace command to determine the immediate caller. Finally, you can programmatically check the consistency of the heap using the malloc_zone_check routine (from <malloc.h>). Set the _GLIBCXX_DEBUG compile-time variable to enable debug mode in the standard C++ library. This item is not supported in GCC 4.2 or later, and you must not use it in that context. In versions prior to GCC 4.0, set the GLIBCPP_FORCE_NEW environment variable to 1 to disable memory caching in the standard C++ library. This allows you to debug your C++ allocations with the other memory debugging tools. In GCC 4.0 and later this is the default behavior. The dynamic linker (dyld) supports a number of debugging facilities that you can enable via environment variables. These are fully documented in the manual page. Table 6 lists some of the more useful variables. On the Mac OS X side these are only available on Mac OS X 10.4 and later. They are, however, available on all versions of iOS. While these environment variables are implemented on iOS, many of them have limited utility because of the restricted environment on that system. The Core Foundation (CF) framework exports the CFShow routine, which prints a description of any CF object to stderr. You can make this call from your own code, however, it's particularly useful when called from GDB. Listing 8 shows an example of this. (gdb) # Check that the prologue hasn't changed $rdi. (gdb) # Nope. Go ahead and CFShow it. Important: If you don't see any output from CFShow, it was probably sent to the console. See Seeing Debug Output for information on how to view this output. Note: In Listing 8 the output from CFShow has been reformatted to make it easier to read. There are a number of other CF routines that you might find useful to call from GDB, including CFGetRetainCount, CFBundleGetMainBundle, and CFRunLoopGetCurrent. Important: If you're programming in Objective-C, you're more likely to be interested in NSZombieEnabled, as described in More Zombies!. Core Foundation supports an environment variable called CFZombieLevel. It interprets this variable as an integer containing a set of flag bits. Table 7 describes the bits that are currently defined. These can help you track down various CF memory management issues. The Core Animation instrument lets you measure your application's frame rate and see various types of drawing. See Instruments User Guide for details. All Cocoa objects (everything derived from NSObject) support a description method that returns an NSString describing the object. The most convenient way to access this description is via Xcode's Print Description to Console menu command. Alternatively, if you're a command line junkie, you can use GDB's print-object (or po for short) command, as illustrated by Listing 9. To break on an Objective-C exception, regardless of how it's thrown, set a symbolic breakpoint on objc_exception_throw. The easiest way to set such a breakpoint is with Xcode's Stop on Objective-C Exceptions menu command. Note: This is better than setting a breakpoint on -[NSException raise] because it will be hit even if the exception is thrown using @throw. The Objective-C compiler adds two implicit parameters to each method, the first of which is a pointer to the object being called (self). The second implicit parameter is the method selector (_cmd). In Objective-C this is of type SEL; in GDB you can print this as a C string. The Objective-C runtime dispatches methods via a family of C function. The most commonly seen is objc_msgSend, but some architectures use objc_msgSend_stret for methods which returns structures, and some architectures use objc_msgSend_fpret for methods that return floating point values. There are also equivalent functions for calling super (objc_msgSendSuper and so on). The first word of any Objective-C object (the isa field) is a pointer to the object's class. Note: If you're interested in learning more about Objective-C message dispatch, you should check out this article. Table 8 is a summary of how to access self and _cmd from GDB if you've stopped at the first instruction of a method. For more information about this, see Some Assembly Required. Listing 10 shows an example of how to use this information from GDB. Important: Listing 10 and Listing 11 were created on Mac OS X, but the core techniques work the same on iOS; read Some Assembly Required for information on how to translate these techniques to iOS. (gdb) # Give the runtime a chance to start up. (gdb) # Set a breakpoint on -retain. (gdb) # Print the 'isa' pointer, which is a Class object. When debugging without symbols, you can use functions from the Objective-C runtime to assist your debugging efforts. The routines shown in Table 9 are particularly useful. 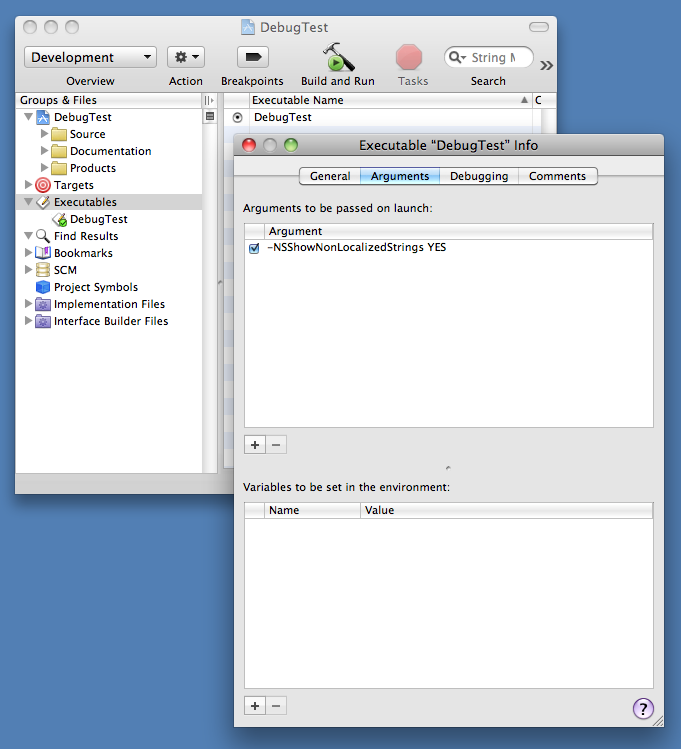 Listing 11 shows an example of debugging the -[DocumentController openUntitledDocumentAndDisplay:error:] method of TextEdit, even though TextEdit does not ship with symbols. (gdb) # this the hard way. (gdb) # Get the Class object for the DocumentController class. (gdb) # Get the SEL object for the "openUntitledDocumentAndDisplay:error:" method. (gdb) # Get a pointer to the method implementation. (gdb) # Confirm that this is sensible. Looks like a method prologue to me. (gdb) # Set a breakpoint on the method. (gdb) # Resume execution, and then create a new, untitled document. You can learn more about the Objective-C runtime functions and data structures by looking through the headers in /usr/include/objc/. Warning: The Objective-C runtime lets you uncover many private implementation details of system classes. You must not use any of this information in your final product. 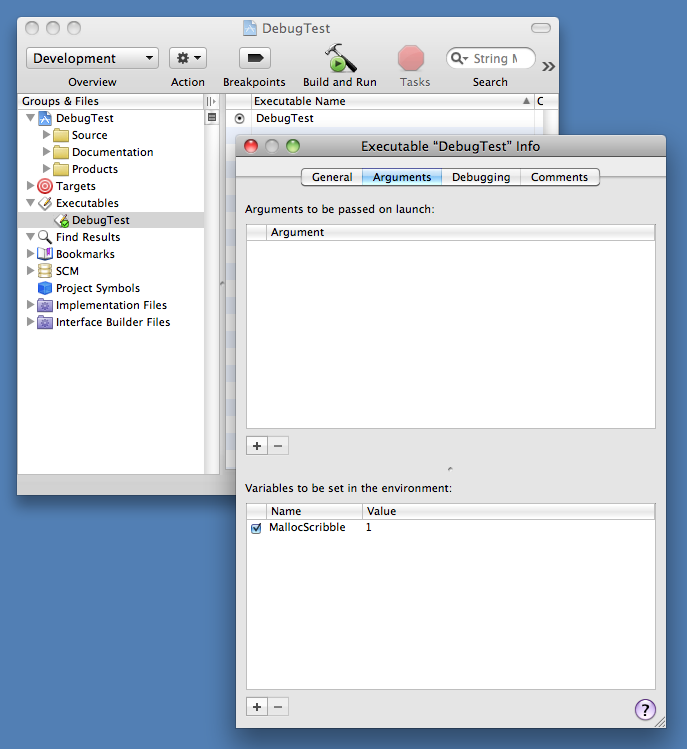 Foundation has a number of debugging facilities that are enabled by environment variables. Table 10 highlights the most interesting ones. Important: To enable or disable a Foundation debugging facility, you must set the value of the environment variable to "YES" or "NO", not 1 or 0 as is the case with other system components. You can use -retainCount to get the current retain count of an object. While this can sometimes be a useful debugging aid, be very careful when you interpret the results. Listing 12 shows one potential source of confusion. Another common source of confusion is the autorelease mechanism. If an object has been autoreleased, its retain count is higher than you might otherwise think, a fact that's compensated for by the autorelease pool releasing it at some point in the future. You can determine what objects are in what autorelease pools by calling _CFAutoreleasePoolPrintPools to print the contents of all the autorelease pools on the autorelease pool stack. Note: _CFAutoreleasePoolPrintPools is only available on iOS 4.0 or later. On earlier systems you can use the NSAutoreleasePoolCountForObject function to determine how many times an object has been added to an autorelease pool. For an example, see Listing 14. (gdb) # d is an NSDictionary created with -[NSDictionary dictionaryWithObjectsAndKeys:]. A common type of bug when programming with Cocoa is over-releasing an object. This typically causes your application to crash, but the crash occurs after the last reference count is released (when you try to message the freed object), which is usually quite removed from the original bug. NSZombieEnabled is your best bet for debugging this sort of problems; it will uncover any attempt to interact with a freed object. The easiest way to enable zombies is via Instruments. However, you can also enable zombies via an environment variable. Listing 15 shows the type of the message you'll see in this case. As shown in Listing 15, the system will execute a breakpoint instruction if it detects a zombie. If you're running under GDB, the program will stop and you can look at the backtrace to see the chain of calls that triggered the zombie detector. NSZombieEnabled also affects Core Foundation objects as well as Objective-C objects. However, you'll only be notified when you access a zombie Core Foundation object from Objective-C, not when you access it via a CF API. If you're using Key-Value Observing and you want to know who is observing what on a particular object, you can get the observation information for that object and print it using using GDB's print-object command. Listing 16 shows an example of this. (gdb) # self is some Objective-C object. (gdb) # Let's see who's observing what key paths. You can set the NSShowNonLocalizedStrings preference to find strings that should have been localized but weren't. Once enabled, if you request a localized string and the string is not found in a strings file, the system will return the string capitalized and log a message to the console. This is a great way to uncover problems with out-of-date localizations. This setting affects NSLocalizedString, all of its variants, and all underlying infrastructure including CFCopyLocalizedString. UIView implements a useful description method. In addition, it implements a recursiveDescription method that you can call to get a summary of an entire view hierarchy. -- The following assumes that you're stopped in some view controller method. The most critical tool for debugging network code is the packet trace. Technical Q&A QA1176, 'Getting a Packet Trace' discusses how to get a packet trace on Mac OS X. While iOS has no built-in packet tracing facilities, you can often make useful progress by taking your packet trace on a nearby Mac. The Energy Diagnostics instrument is a great way to understand how your application affects battery life. See Instruments User Guide for details. Technical Note TN2265, 'Troubleshooting Push Notifications' is a comprehensive guide to debugging push notification problems. It also includes a configuration profile (APNsLogging.mobileconfig) that you can install to enable additional debug logging. iPhone Simulator lets your build and run your iOS code on Mac OS X. Because iPhone Simulator is a Mac OS X application, you can target it with a variety of Mac OS X specific debugging facilities. For example, if you have a problem that can only be solved by DTrace (which is not available on iOS), you can run your application in the simulator and point DTrace at that. Important: The simulator is great for debugging, but the ultimate arbiter of what will and won't work on iOS is a real device. It is especially important to keep this in mind when doing performance testing and debugging. For more information about Mac OS X debugging facilities, see Technical Note TN2124, 'Mac OS X Debugging Magic'. New document that describes a large collection of iOS debugging hints and tips.